I Shaved My Legs For This? « It's For My RP Spec! 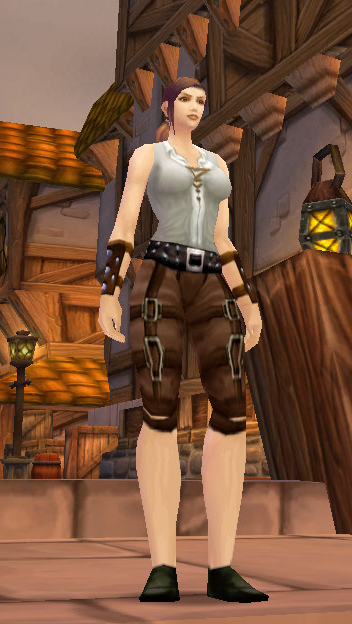 Etana lives on Wyrmrest Accord, where all my RP characters reside. She has been through several revisions, including whiny member of the Night Watch. I have watched the Auction House for full armor for her for months now and somehow always came up with things like the Revenant set. She sat at level 30 or so, wasting away in the Bank while I complained about the lack of full-coverage armor. And then one day, I decided she needed to be 40 for an epic pony. And then… well. Somehow she became level 73. So it goes. As a side note, I’m trying a new way of linking the outfits. WoWHead has an amazing function called Compare that lets you create list of items and link directly to it. If it doesn’t work, feel free to comment. Second side note! Some of these outfits require being a higher level warrior due to the weapons being 2H. Titan’s Grip is a must to recreate. First up are two similar outfits that really say “guard” to me, but fit a warrior in general. 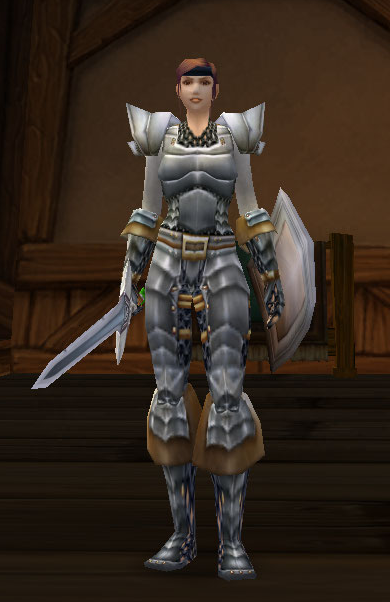 Next is Etana’s Northrend armor, minus helm. The shield was a great quest item addition and matches perfectly. 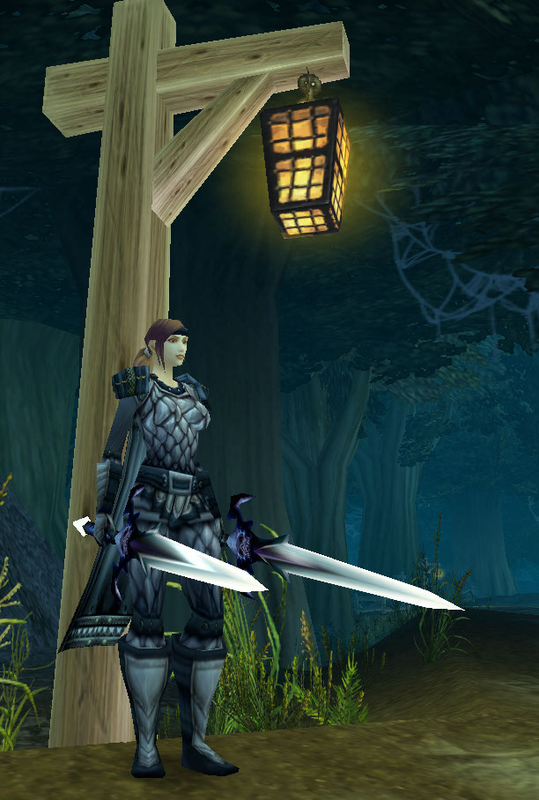 Etana’s Duskwood outfit. 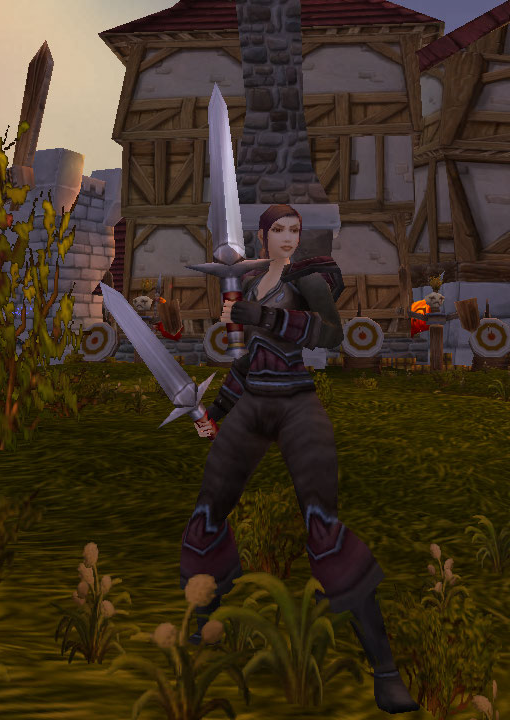 Dark and full-coverage with intimidating blades. 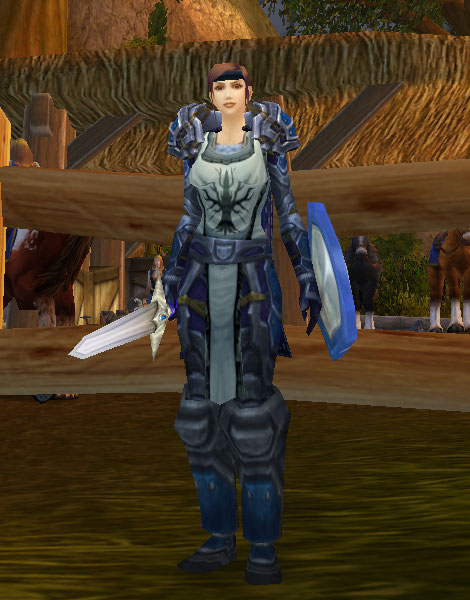 A Northrend “DPS”-style outfit. TG for two massive swords. 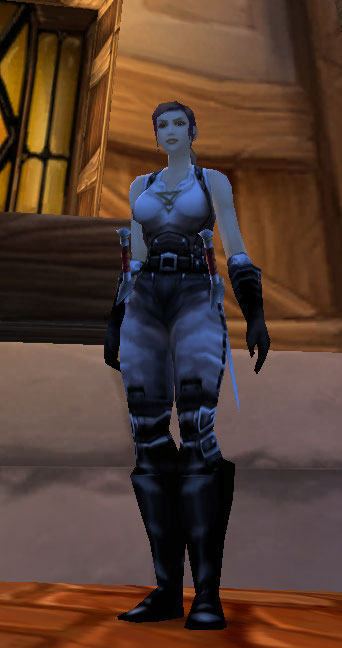 The Bandit set is a bit revealing for my tastes; it doesn’t really fit her character, so I borrowed Tanwen’s Sleeveless T-Shirt to make it a bit more modest. I have found myself falling in love with a lot of vendor trash lately. This oufit is no exception. Extremely casual. Capri-style pants, a sleeveless shirt, and plain shoes. Okay, okay. This outfit may be belly-baring, but! The style and colors scream ‘warrior’ to me for some reason. There are a few recolors of this set, but this is my favorite. 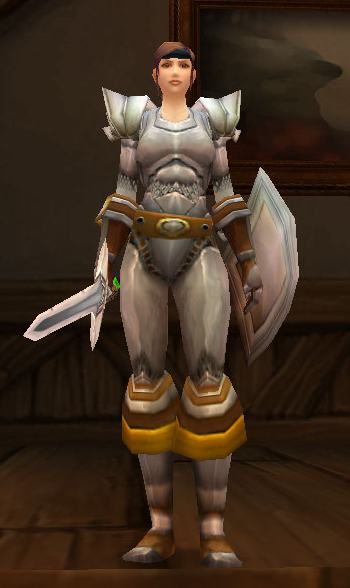 I have several other sets I’m working on for Etana, including the Outland-level Valor recolor (because let’s face it, Valor is sort of… garish). 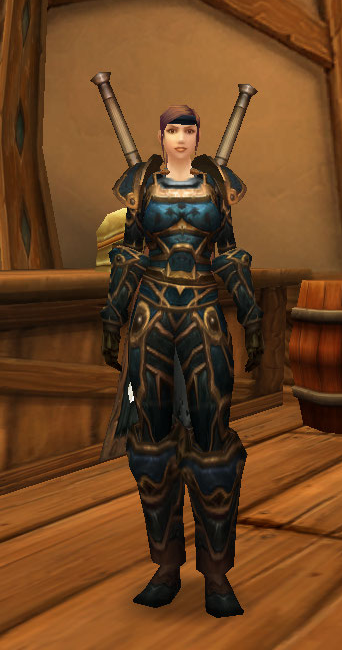 Perhaps if she ever makes it to 80, I will have some actual armor sets to write about and not things I’ve thrown together. But I’m veering from the point of this post: less mithril lingerie, more armor that would actually be worth a damn in battle, Blizzard. Thank you for this! 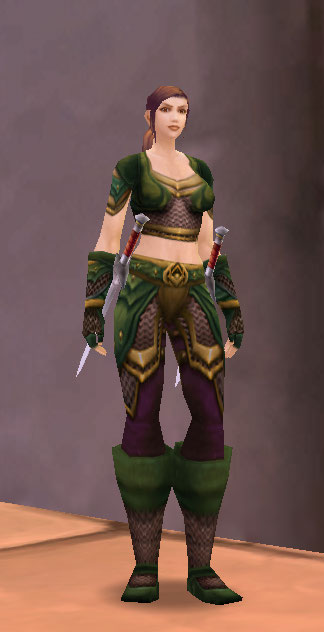 Trying to find a tanking set that looks like you should be taking hits is such a pain sometimes. My female orc warrior Inkai will present a beautiful but deadly package come 4.3 and transmogrification. Pieces of the darkcrest and warmaul sets will come together with Spaulders of Dementia and High Warlord’s Battle Axe. 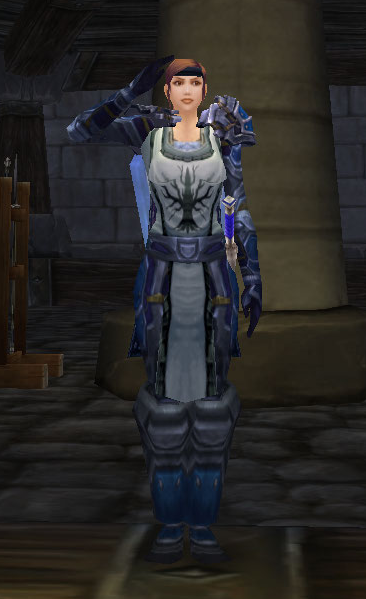 Inkai doesn’t wear capes or helms with her sparse armor, partially due to pride over her appearance, and partially due to her long braid of hair that hangs down her back. Have you thought about the Overlord’s items?